Editor's Note: The following notes on painting the Enterprise-A were develpoed after an exhaustive review of available material on the subject by Ron. Please direct any questions, comments or critiques to him at the eMail address above. 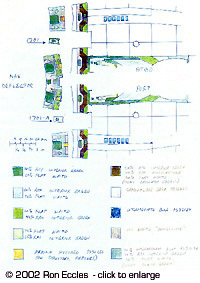 Unfortunately, these pics did not scan very good as they are colour photo copies of my original drawings, and the person who scanned them for me said he had a bit of reflection from the paper. I hope that everyone is able to get what they need from them. 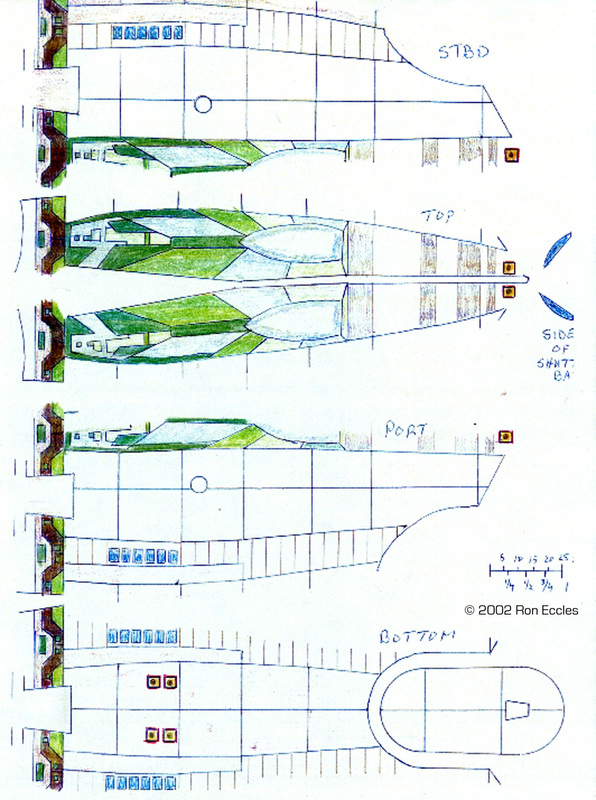 I extend my thanks to Mark Dickson who posted his wonderful pictures of the movie Enterprise, as I carefully studied his pictures in order to draw out these templates. Please note that my approximations of the colours are my interpretation, and the paint mixing ratios that I used are approximate. I use Testor Model Master enamels. Because the scans ended up not quite as clear as I would have liked, I'm including a supplemental description in order to provide any clarity on the pictures. Also note too, that the deflector grid panel lines on the sides and bottom (and under shuttle bay) of the secondary hull have been rescribed to match the studio model. Overall colour: Green (RAF Interior Green + Flat White FS37875): I started with a light colour mix of approx 75% white/25% green and painted the entire front section. I masked off the light colour, then added more green to a 60% white/40% green ratio. The third shade is a 60% green/40% white mix and the final shade is 80% green/20% white. The dorsal and pylon stripes were painted the second shade, with detail added from the last (darkest) shade. The base of the nacelle pylons looks to be a pale bluish-green, slightly lighter than that around the nav deflector housing. Add two single phasers to the top of the shuttle bay, one port, one stbd. I have yet to start on this area, but this is my plan. The first outer ring immediately surrounding the nav deflector looks to be French Light Blue and the second ring looks to be a dark Camouflage Grey -I'll get back to this second ring. 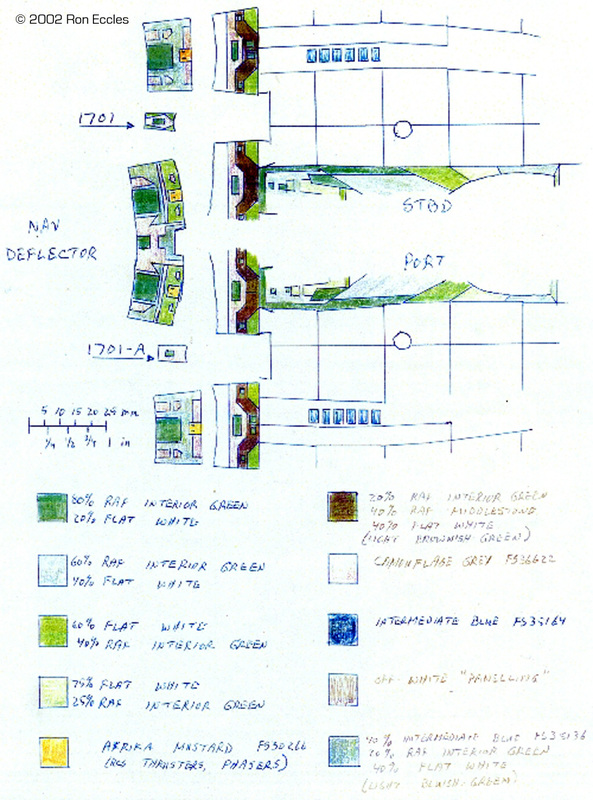 My image has the four quadrants surrounding the nav deflector drawn to scale, as well as the main deflector housing. Because of the curvature of these sections, some "masking" will actually need to be a little longer than shown. The four quadrants (above/below Starfleet arrow emblem) overall appear to be a brownish-green, whereas the engineering section is more green. I plan to mix the RAF Interior Green with RAF Middlestone in order to produce this brownish-green colour (20% green/40% middlestone/40% flat white to start). The foremost sections of these quadrants (including the separate "ring" that separates the quadrants from the deflector housing) is a paler colour, almost the same as the torp launcher, which I will do in shades of Camouflage Grey FS366212 or possibly a darker shade of tan-brown. The second ring mentioned earlier also looks to be this colour. This appears to be a bluish-green colour, so I will be adding Intermediate Blue FS35164 to my green base (40% blue/20% green/40% flat white). Note that the big "squares" on the front of these sections is the darkest green shade. Note also the difference in "design" of the three "sensor" plates (forward of Starfleet arrow emblem) for 1701 and 1701-A. The area aft of these plates (where the Starfleet arrow emblem is) is a slightly paler shade of brownish-green than that of the quadrants themselves, and also slightly lighter than the bottom of the hull. These deflector grid panel lines were totally rescribed from scratch. Please note the lack of vertical deflector grid panel lines directly underneath the botanical garden windows. This area, and the entire underside is a pale tan-brown, and I plan to use strictly Camouflage Grey FS36622, but will lighten/darken as required for a "panelled" effect. Note: Add four single phasers to this area, as shown at left. The angled/curved strips on each side of the shuttle bay I painted Intermediate Blue FS35164. The exterior deck entrance to the shuttle bay is Black. 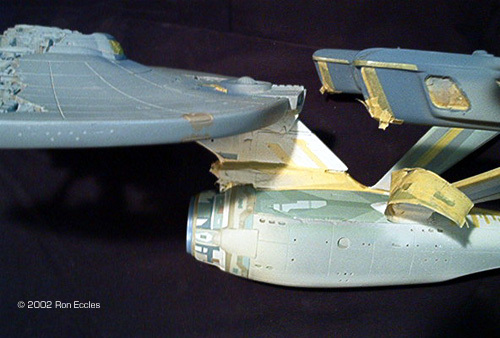 The leading edge of the nacelle pylons and front of the nacelles are Intermediate Blue, as well as the front, back and saucer support section of the dorsal. There are also thin vertical stripes (5mm apart) running along the entire section in which the botanical garden windows are, which I will paint a pale grey - probably the same grey as the lines that run around the saucer edge (possibly Light Ghost Grey FS36375). Phasers and RCS thrusters are Afrika Mustard FS30266 with a dark grey. The phasers are encircled by a red ring. The grey ring around the deck area below the bridge is a dark grey, possibly Dark Ghost Grey FS36320 and the area immediately surrounding the officer's lounge windows is Intermediate Blue FS35164. The base of the bridge is surrounded by a French Light Blue circle on the saucer, and the bridge top is a pale yellow colour. 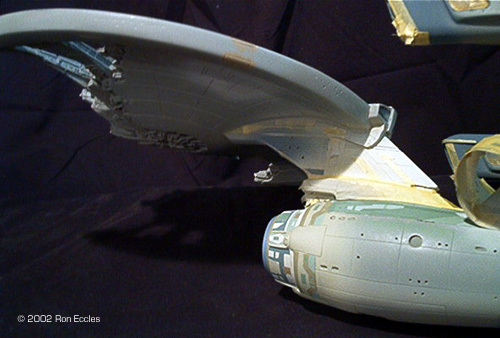 http://www.cloudster.com/Sets&Vehicles/STMPEnterprise/STMPEnterpriseTop.htm: Lots n' lots of incredible images, both of the Big E as she was painted originally, and after the repaint done for TWOK and beyond. Big ones too! 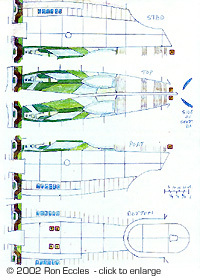 http://www.olsenart.com/strek.html: Paul Olsen's website - he's the fellow that painted the ship for TMP. This page copyright © 2002 Starship Modeler. Last updated on 9 August 2002.